Asteroids mining is referred to as the exploitation of raw materials from asteroids and other minor planets, which also includes near-earth objects. Minerals can be mined from an asteroid or spent comet and then used in space for construction material or can be taken back to earth. These resources or raw materials include gold, iridium, silver, osmium, palladium, platinum, nickel, and aluminum. According to NASA, the minerals that lie in the belt of asteroids between Mars and Jupiter hold wealth equivalent to a staggering US $100 million for every person on earth. There is an increase in demand for planets limited resources with growth in the worlds population. This has led to several governments and private enterprises to set their sights in outer space for various resources which is expected to drive the global asteroid mining market. Ongoing and impending space mining missions, increasing investments of private stakeholders in space mining companies, and adopting 3D printing technology in asteroid mining are the factors expected to drive the growth of the asteroid mining market. However, the high cost associated with the mining techniques and regulations regarding proprietary rights act as a major barrier and hampers the asteroid mining market growth. In addition, various risks associated with asteroids mining also hamper the market growth. Furthermore, factors such as rise in number of government initiatives to frame regulations with respect to asteroid mining and adoption of In-Situ Resource Utilization (ISRU) practice in space exploration are expected to offer lucrative opportunities for the market. 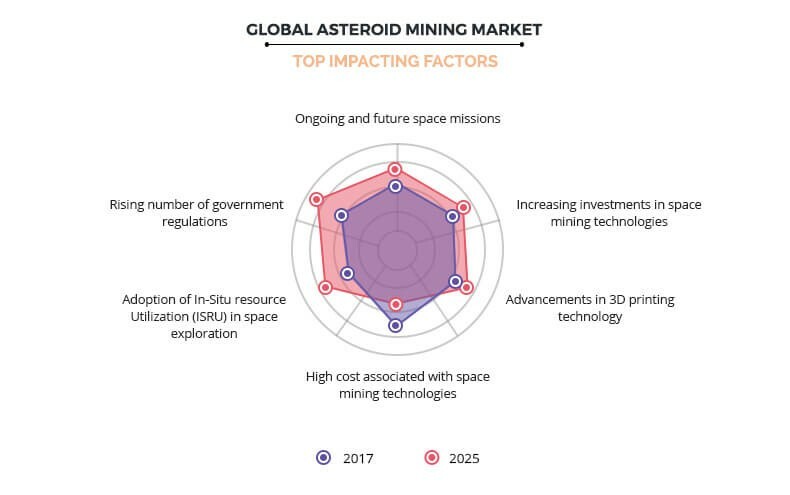 The factors such as ongoing and future space missions, advancement in 3D printing technology, high cost associated with space mining technique, rise in number of government regulations regarding space mining, and adoption of in situ utilization practice in space exploration are expected to significantly affect the growth of the global asteroid mining market. These factors are anticipated to either drive or hamper the market growth. Over the last hundred years, the human population has exploded from about 1.5 billion to more than seven billion, driving an ever-increasing demand for resources. Scarce materials can be obtained from asteroids if financial and technological constraints can be tackled. Advancements in technology coupled with innovations are expected to reduce the costs of asteroids mining. For instance, Deep Space Industries has proposed to launch Prospector 1, to a nearby asteroid and assess its suitability for mining precious materials. The project has been proposed to launch somewhere around 2020. In addition, projects such as Jupiter Icy Moon explorer (JUICE), Square Kilometer Array Project, and The modern Space Race project by Blue Origin are some of the projects expected to launch in the near future. Such future and ongoing projects and missions on space technologies drive the growth of the global asteroid mining market. Celestial bodies, such as the Moon and the asteroids possess metals that are currently mined from the earth. According to the estimates, mining on the moon would initially cost around $9 billion. In addition, capturing parts of near-earth asteroids, the target of companies already developing programs to begin mining in space, may be just $492 million. According to Planetary Resources Inc., an asteroid-mining venture backed by Google Larry Page and Eric Schmidt, each mission to mine an asteroid may cost only between about $50 million and $100 million in the near future, which would make this venture very costly and difficult to be implemented. Such high cost associated with the space mining technique restrict the growth of the asteroid mining market. There has been an increase in trends in supporting the space technologies at the global front. The U.S. is at the forefront of developing the space economy. U.S. Departments of State and Commerce have undertaken reforms to ease the satellite export control regime while the Office of Space Commerce coordinates relevant policies to promote the growth of the domestic commercial space mining industry. In addition, NASA organizes various competitions and provides technical assistance for the development of novel technologies such as 3D printing, space solar power, electric propulsion, and others, which assist in the growth of asteroid mining through which various space entrepreneurs and their commercial enterprises benefit. The rise in government regulations and support offers lucrative opportunities for asteroid mining market expansion. The asteroid mining market is quantitatively analyzed from 2017 to 2025 to highlight the financial competency of the industry. Asteroids mining is anticipated to enable the extraction of rich resources of the asteroids in the space. It is being developed by a variety of companies which is leading to the enlarged scope of the business over the coming years. For instance, European nation’s Luxembourg hopes to be the global leader in the emerging race to mine resources in outer space. Luxembourg is investing 25 million euros in privately owned company Planetary Resources, an asteroid mining startup, which is expected to launch its first commercial asteroid prospecting mission by 2020. The Satellite Industry Association (SIA), a forum formed by several major U.S. satellite companies for the discussion of issues, regulations, policies, and developments related to satellite industry, ordered for the launch 23 commercial GEO satellites in 2013. Out of the 23 satellites, 15 satellites were to be launched by the U.S. manufacturers. The growth in number of satellite and spacecraft launches coupled with the increase in financial funding by the government boost the growth of the asteroids mining in North America. 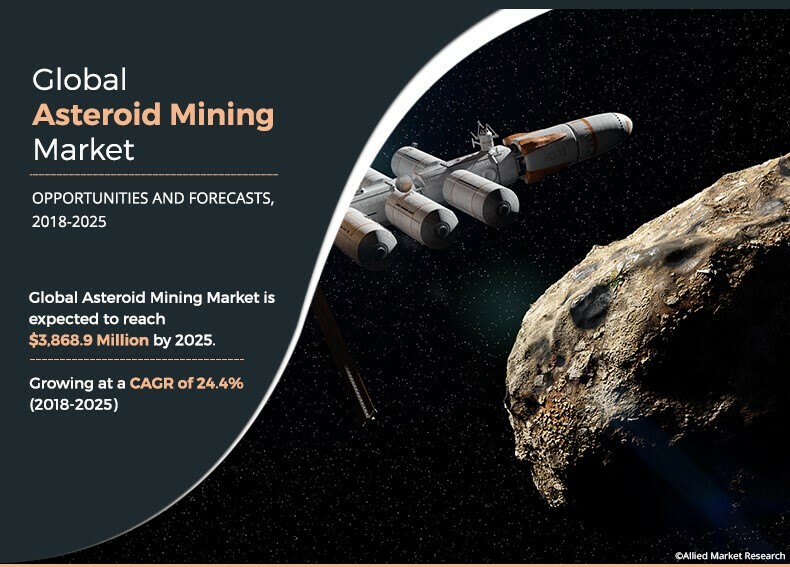 The rise in investment in the field of space mining, along with technological advancement in telecommunication industry are expected to drive the growth of the asteroids mining market during the forecast period. There is an increase in demand for planet’s limited resources with the growth in the world population. This leads to several governments and private enterprises to set their sights in outer space for various resources. In various near-earth asteroids and moon, there is an abundance of water and other precious metals.